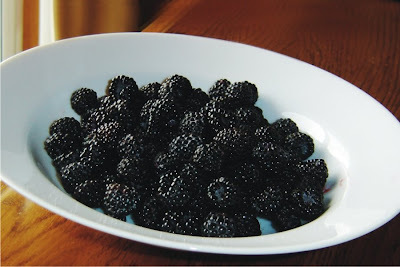 I love pretty much every type of berry there is but, my absolute favorite are blackberries. I'm so fortunate that I get all sorts of produce for free. Thanks Dad! Ever since I remember my Dad has had the most lush gardens ever. Seriously, he grows everything. When myself and my siblings were young we'd have plenty of chores to do in the garden and of course back then it wasn't my favorite past time. My Dad would spend hours tending to them and picking all of the goods. I recall hovering over the blackberry bushes and eating them just as fast as I could pick them - YUM! Friday my Dad dropped off a ton of blackberries and it couldn't have made my day any better. 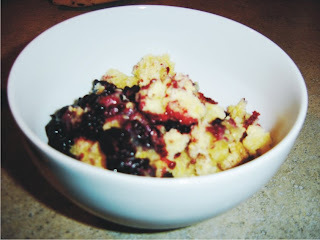 That night I made one of my favorite desserts to make with them - Blackberry Cobbler. It's so easy and so delicious. 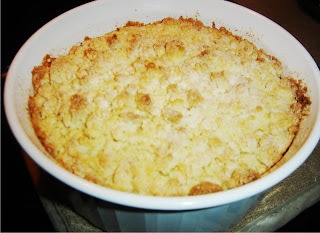 It's a recipe that you must eat warm and topped off with vanilla ice cream. Combine the dry ingredients in a medium bowl. Cut in shortening. Stir in eggs. Mixture will be crumb like. Fill pan with berries. Add crumb mixture on top of berries. Bake at 350 degrees for 30 minutes. Serve warm with ice cream or whip topping.